How Important Are New Construction Home Inspections? Do I Need a Home Inspection with New Construction? If you’re buying a new construction home, you might assume that a home inspection isn’t necessary. After all, you had the house built from scratch and customized to your exact needs and likings. No one else has ever lived there, and no time has passed for anything to break or go wrong. Wouldn’t a home inspection waste your limited time and money? That depends on how you look at it. For many, a home inspection can provide valuable insights into their property’s construction, as well as the chance to prevent costly repairs on the home later on down the line. For others, a new home inspection may seem like just an extra cost in an already very expensive time. A home inspection is a third-party evaluation of a home’s structure, systems, appliances and other important features. The inspector will evaluate your property, give you a report on all his or her findings, and you can then go to the seller (in this case the builder) to fix any desired issues before you close on the home. In a nutshell, inspections can help ensure you’re getting a safe and hazard-free property, that you’re making a good investment, and that you won’t have tons of repairs to make before move-in (or worse, right after it). Though home inspections are optional, most homeowners get them—often at their real estate agent’s recommendation. Though it would seem that new homes should be relatively error-free, according to many inspectors, they often have underlying issues at work. Inspectors say they also often find incomplete projects. This could include insufficient insulation, half-installed handrails or fixtures, or missing pieces of hardware. How Many Inspections Do You Need? 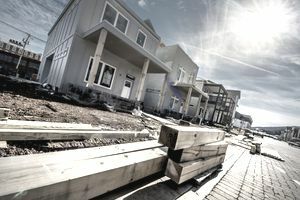 With a new construction home, the International Association of Certified Home Inspectors recommends you have two or three inspections on the property. The first inspection is called a foundation or “pre-pour” inspection and occurs just before the foundation is poured on the home. This one ensures the site has been excavated and graded properly, that anchors and footing are adequately spaced and in place, and that the stage is set for a strong and long-lasting home. In the event the inspector finds issues on this go-around, it allows the builder to make adjustments before pouring the foundation (when there’s generally no going back). The second inspection you might consider is a framing or “pre-drywall/sheetrock” inspection. This one happens after the entire frame has been built, the roof is on and the windows are installed, but before the sheetrock and walls are put up. It allows the inspector to make sure the beams, posts, studs, and other structural components are installed properly, as well as check things like the wiring, plumbing, window flashing, and other elements that are generally hidden behind the wall. If any problems crop up on this inspection, your builder can fix them before going further with the project. The final and third inspection is the one you would have on any resale property—the one that ensures the home is safe for occupancy and has been finished per local code and building standards. Anything your inspector finds on this inspection should be remedied by your builder before closing. New home buyers can certainly skip the home inspection stage, as can any other homebuyer. The risk in this is that unknown issues with the home could crop up after move-in, when it’s too late for the builder to fix it (and pay for it). If you do skip a home inspection on your new property, make sure your builder has a warranty in place. This can protect you in the event something goes wrong after you’ve closed. These warranties usually last about a year. New construction home inspections allow you to be proactive about your home purchase. On a resale property, you can only inspect the home after the fact—meaning all you can do is repair an issue or cover it up. With a well-timed inspection in your construction process, your builder can actually get to the root of the problem and remedy it entirely before the build goes further. Remember, don’t judge a book by its cover. Just because a new home may look flawless to the naked eye doesn’t mean it’s perfect below the surface. Calling in a qualified home inspector can ensure you’re making the best decision for your family and your finances. Problems With Your Home's Final Walk-Through? How Long Does a Home Inspection Contingency Last? Does the Home You're Buying Warrant a Special Inspection? What Happens After Your Home Inspection? What Factors Figure Into the Cost of a Home Inspection?